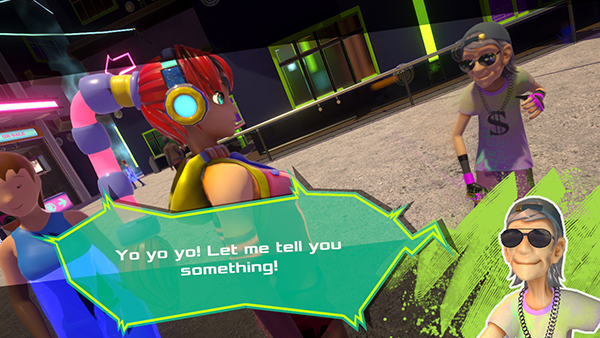 Neon Tail is an open world roller skating game where you follow a young girl’s adventures and save the streets of Bluepulse City from a dimensional disaster. She will meet many colorful characters and explore many fantastic locations of the city, from its various districts (shopping, business, residential etc) to its subways and sewers, to the unknown planes of existence. 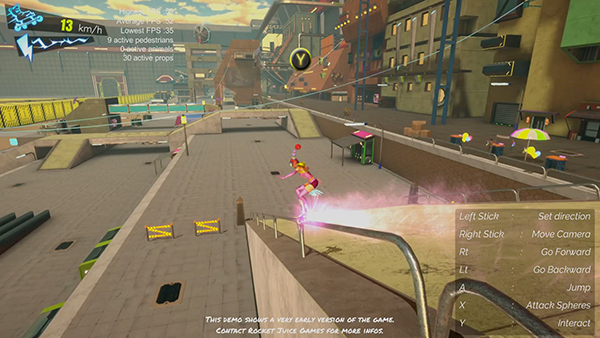 You play as a rising SFS Pro star, who acquired mysterious powers from a powerful being. 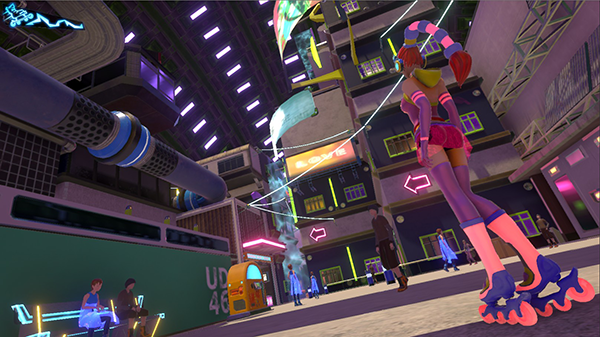 You can take small jobs, go shopping, relax in restaurants and cafes, chill with other NPCs, and earn fame and fortune by becoming a Skate for Street Pro star player! 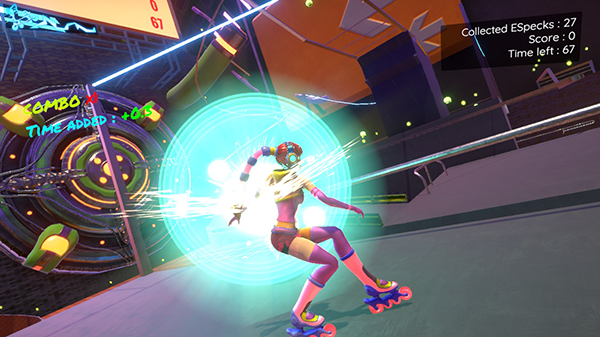 The new roller skating physics controls are both intuitive and fun to play with, and we're planning on filling the world of Neon Tail with interesting people, all befriendable. Visit Drone shops to upgrade or install extensible modules on your camera drone Modulo. On your adventures, you will meet Telopern, an extra dimensional godlike creature. He will give you strange powers that you will need learn to live with. and powers to save your city from a dimensional disaster! Story plot in short : Save your city! Love it. Looking forward to what it becomes. Thanks for your link, It's cool! As usual, lots of miscellaneous bugs fixed. See you next week! Good luck with your project! By the way, what kind of music do you put into this game? Thanks! I agree with what you said, I've spent a lot of time tweaking the physics, the animations, and the input response for this one, I feel quite satisfied with what I've got for now, but I need to nail the level design to make it a smooth experience for the player's learning curve. It's not easy to master but it feels awesome once it is, so this might prove to be quite a challenge. About the music I have something a bit electronica / pop with a spice of crazy in mind. I will make some further researches once more environment is available. I think the aesthetic looks great! Seems like the camera got a bit wonky once you were going up and down on that wall later in one of the videos. Gonna be really cool to see the progression of this. 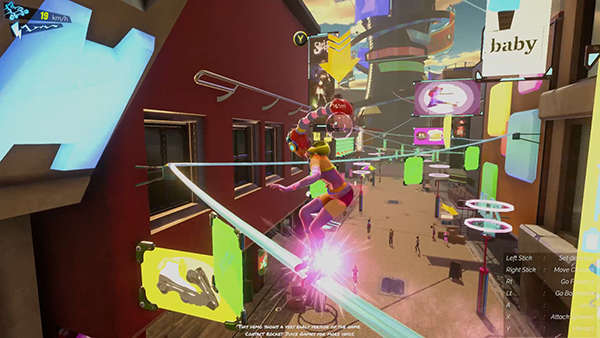 When a game has good movement options for getting around the world, it's an instant boost to my love of it. This looks rad. How long have you been developing this for? I've spent a lot of time tweaking the physics, the animations, and the input response for this one, I feel quite satisfied with what I've got for now, but I need to nail the level design to make it a smooth experience for the player's learning curve. It's not easy to master but it feels awesome once it is, so this might prove to be quite a challenge. Thanks! Yes I'm aware of the camera wonkness, but that's me trying to fix a 3D animation decision through coding. I didn't thought about it much until I got there, but I know how to fix it now. Basically my wallrunning animations are done as if the ground was the wall, forcing me to rotate 90 degrees in the code. Theoretically this wouldn't be even noticeable if the camera wasn't lagging behind. Will be fixed soon! It's been around 6 months now. 3 people full time on it. 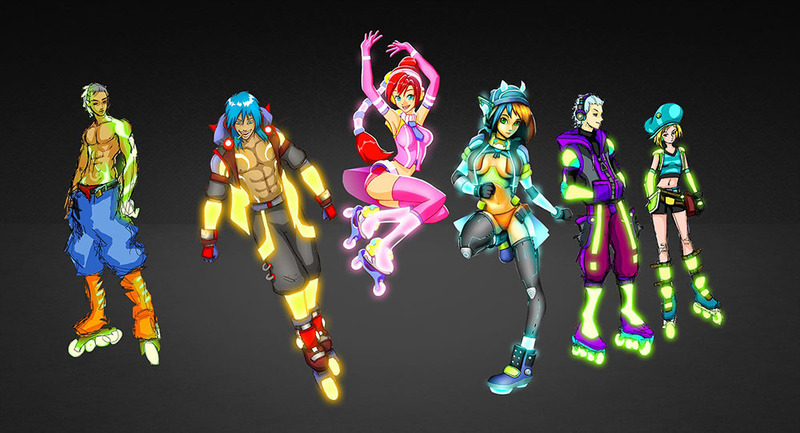 Haha SSX was really fun, and yes you're right about that. Open world means you can go anywhere, means you can't predict where the player will go, means you can't focus on one or few paths and design it with the exact knowledge of where the player is trying to go in mind. On the other hand that's what makes open world fun! And although way harder, design a few possible paths at least is not an impossible task neither. We'll just give a few mockup a try then whip it up through testing over time. Hi there! It's been a while since my last #screenshotsaturday ! 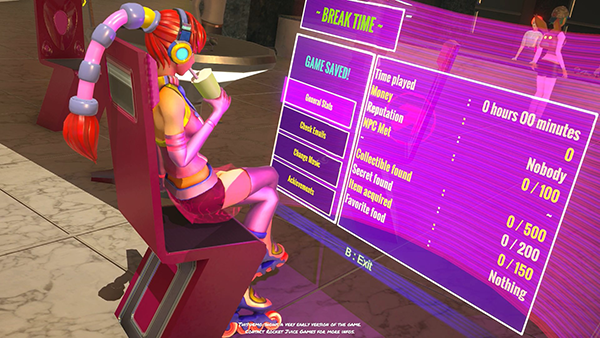 I've been busy writing the game's designs, designing workflows, testings, modeling props, adding small animations, writing editor tools, and tweaking small changes to the wallriding code. I'm slowly replacing the mockup geometries with occlusion cullable props. Previously for the prototype, the environment meshes were huge, so no occlusion culling, and we had big pixel ratio problems. It wasn't optimised at all but I knew it, we were simply rushing for a presentation. Now with the LOD and the occlusion culling and a workflow written down, these should allow us way more details and flexibility as we slowly build up our props library. The environment is completely a work in progress, as well as everything actually, but I believe the foundation of everything is ready for the executive work, so it's getting there, one small step at a time. I love the sfx, especially the direction arrow! I've never seen the cartoon, that it is interesting. Let's skating in the city!! Hi, this week's devlog shows some progress over the props, slowly but steadily appearing in the environment. Still a long way to go, but I'm on it. The lighting needs some attention too, I'll get at it when all the props are created and placed. Falling from the glass building's slope sprung me out super far, I wasn't expecting that... I'll have to take a look at what happened there when I have the time. Anyway, one thing at a time, too many things to do, not enough time, I'll see you next week! were their soundtracks. I'm surprised both videos didn't have any audio. I would throw some of that electronica pop in their to give the game more ambiance/atmosphere. Games looking cool, can't wait to see the level development!